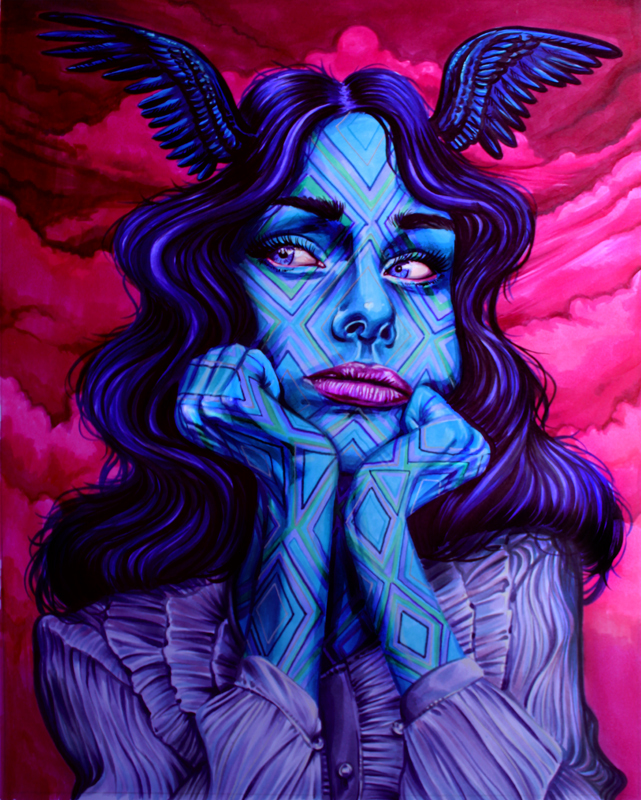 We are ending this year with one of the most anticipated and extraordinary Solo events of our gallery: "A Fractured Flutter" will be presenting an amazing collection of art from none other than Dustin Bailard, for his first solo event. He will be joining us all the way from L.A. - so for any Dustin Fans in the midwest region, here is your chance to meet and support him in person. What an Amazing Gallery Year - 2017! 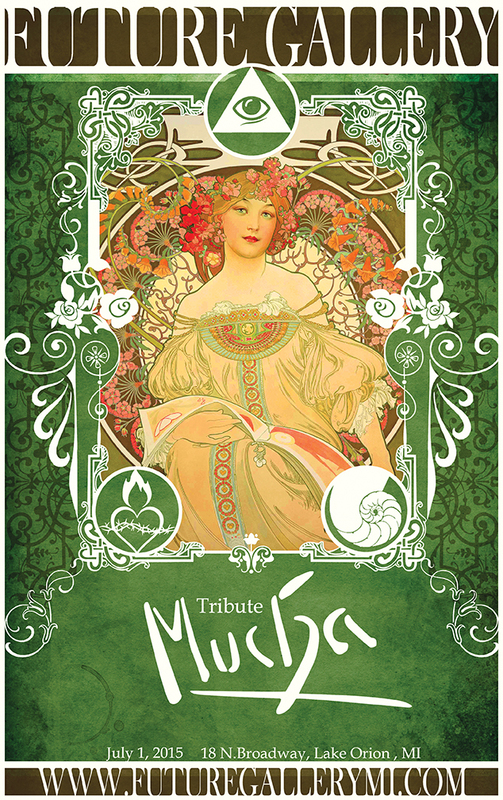 We are revisiting the themes of the year one last time: The Muse, Nature, Mucha Tribute, and Sacred Art. I'm sure this will be a collection not to be missed! This is one of our strongest exhibits to date. "Fractured Flutter" a premiere Solo exhibit of Art from the very talented Dustin Bailard. Alongside Future Gallery's Winter Gala 5; Including a roster of talent that seem to be growing stronger with each and every exhibit to date. Representing the Nou-Contemporary: Art work manifested through Skill, Passion, and Integrity. Thank you for looking, sharing, or commenting - your support for the contemporary arts means very much to us here! Celebrating the realms and ideas within the Occult traditions and Sacred Geometry Art. These ideas have been around for thousands of years and still very relevant to many today. Spiritual or Divine art often explores ideas which transcend verbal explanation, normal human experience, or express something sacred. Much in this long lived tradition, we hope to explore these realms with this amazing group of artists - surely a rare and wonderful opportunity to anyone who finds enjoyment of these subjects. @art_of_bob_doucette will be sharing his wisdom and good company this up coming #paintnight #wizardofpaint #noucontemporary Our local art collective hosts an artist gathering first wednesday of every month 6pm-midnight 💖 Our dialogue on #aesthetic #artbusiness #contemporaryart is much of the reason this group is learning so fast. We plan on hosting future guest artists; but #bobdoucette is our first major out of state guest! Bob has an amazing portfolio of painted works, brilliant whimsy within his concepts, and a wonderfully diverse journey through the art world- maybe we will be lucky to hear about. Every year we celebrate the life and influence of the art masters that have come before us. In homage, paying respect, and reflecting upon their influence now upon contemporary, living artists now. His influence has had an incredible impact on the way we approach design, with his timeless and very distinct graphic style - often said to be noted to usher in the Art Nouveau style. Though he himself would consider the elements of his work to be timeless, based upon rigorous study of the classical principles, and in accord with a contemporary style that was a regional movement, throughout Paris to Prague. Much more info to come... Please come join us on July 1st, as we celebrate and honor this legendary artists work and contributions to the arts. Please join us in celebrating the art masters before us, through the contemporary artists in the world we live in now. Join them into their dreams, imaginative creations, and heart felt expressions in paint, pastel, steel, and graphite. 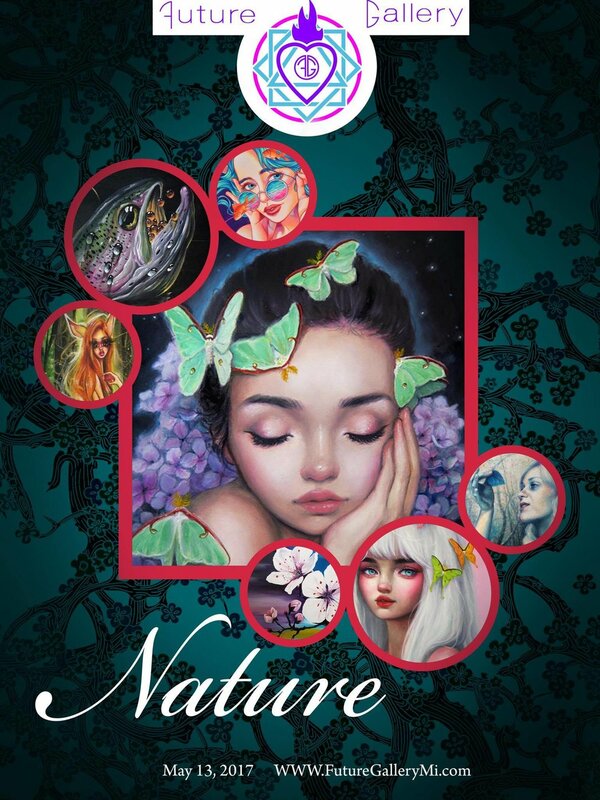 We are extremely honored to be hosting Happy D. as our solo exhibition during our Nature show! This will be going on during the flower festival that is held annually in Lake Orion, and it will be one of our most viewed series to date! Happy D. will be one of the finest pairings for this event we have ever had and we expect only the greatest of results! Alongside this show is a VERY special solo show by world renown Happy D. Artist gracing Future Gallery with an amazing collection entitled "ACTIAS" Her oil paintings are wonderful to see online, along her very popular Youtube videos, and Patreon learning channel; ALAS, seeing this work in person is unmatched by any screen image experience. Come see for yourself on May 13th! Since 2015, love and interest has grown rapidly for Yishu Wang Art, enchanting us through all of 2016's group shows. We couldn't think of anyone more fitting to pair with The Muse group show; Her first Solo since she has returned from the US to China. We are excited to have her along for this exhibit. The most representative symbols in Yishu's works are these dreamy portraits of little girls. They are my emotional shelter, carries all my happiness and sadness, combined my past and present, thus these girl are innocent and yet sometimes they can feel complex emotions. I gave my girls cartoon-like oversized head, however with realistic details, to make a sense of vague circumstances that one cannot tell whether a dream or reality. I hope such surrealist world can evoke fundamental human emotions in exquisite, for myself and for my viewers. After graduating from Xi’an Academy of Art in China, she pursued further study in United States and gained the MFA degree. While Yishu studied in US, she realized the real difference between cultures. As well as the experience she lived in Japan during her childhood, she look forward to present the beauty of different cultures in her works, just like what she was experiencing. Works will be available for this show along the website Aug 19th. Preview Inquiries available through our Contact section. 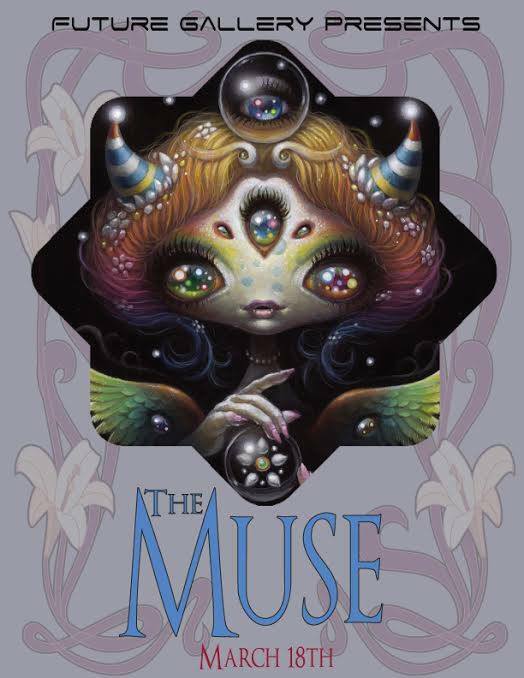 Works centering around "The Muse" - translated openly by the Artists. Be that a source of inspiration, an embodiment of the creative spirit, maybe even a mythological translation of the Muses. We shall very soon see! 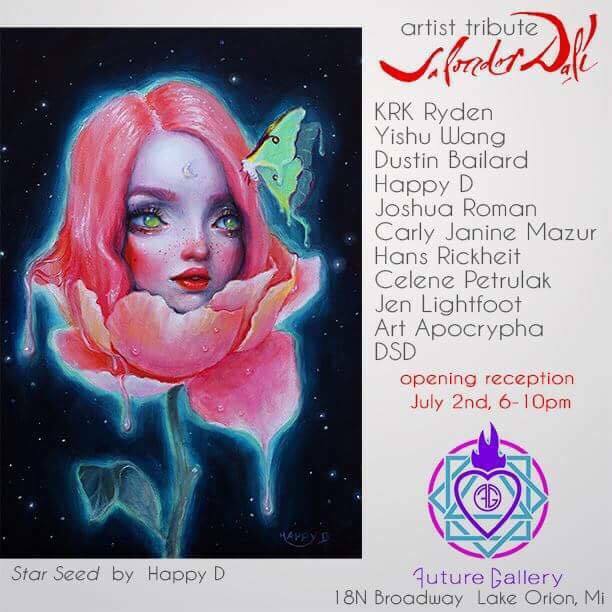 FEATURING:Yoko d'Holbachie, KRK Ryden, H.R. Giger, Tom Bagshaw,Dustin Bailard, Lizz Lopez, Yishu Wang Art, Joshua Roman Art, Brynn Elizabeth Art, Crystal Mielcarek, Jen Lightfoot, Big Helmet Head - the art of Carolina Seth, Lioba Brückner, Erin Kruczek, Hana Mulyati Michelle Thibodeau, Margaret Morales Art & many more. 2016 has been a wonderful year, as Future Gallery brings to you some of the brightest and boldest Artists of our time. Venus Rising features a exhibit inspired by beauty, elegance, and personal vision. Out First Annual Artist Tribute Series - celebrating Salvador Dali in all his genius, madness, and creative passion. In a contemporary art world that is inspired with "Pop-Surrealism" much would be to the credit and impact of Dali's Art. You may say surrealism is ever more relevant, in a world that finds it's psychological state much to be questioned, and deconstructed often by today's visionaries.